The Single Euro Payment Area (SEPA) EU initiative to streamline bank transfers is just around the corner. Will your business be ready? Leading up to the February 1, 2014 SEPA compliance end-date, corporates must implement the right strategy to ensure SEPA compliance, including converting BBANs (basic bank account numbers) to IBANs (international bank account numbers) with BICs (bank identifier codes), modifying files to the new XML ISO 20022 standard and considering if direct debit mandates need to be resubmitted. For those corporates that have not yet started to prepare, delays in processing, increased operating costs and potentially serious cash-flow consequences lie in wait. 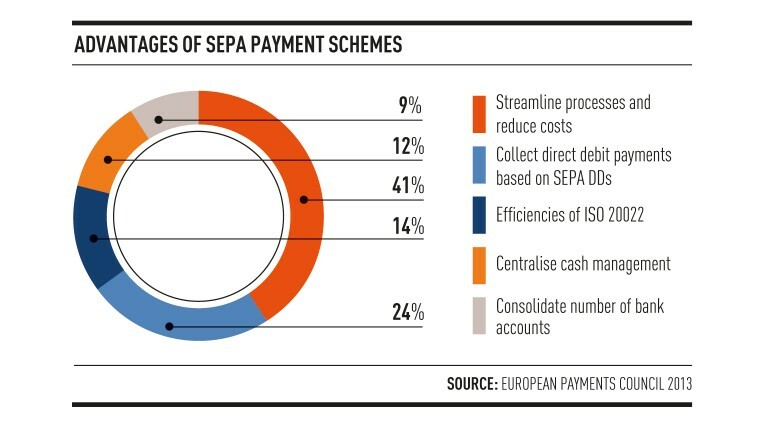 Corporates who embrace the changes brought by SEPA should expect to see a full range of benefits, including greater flexibility with banking partners and lower costs in their payment operations. SEPA ensures all euro transfers are made in the same way everywhere in the SEPA zone, within a predictable timeframe and at the same cost irrespective of destination. Beyond simply being able to ensure remittance information is accurately transmitted and received, corporates can also leverage advantages from settlement windows to help streamline their operations and reduce their fees for payments. The standardisation brought on by SEPA will be an important mechanism corporates can leverage to ensure control of their receivables. They can also minimise the need to access expensive lines of credit and sustain appropriate liquidity for supporting daily operations. Finally, the standardisation affords a corporate greater flexibility to switch bank partners. The switching power will help to drive attractive pricing negotiation leading to improved profitability in treasury functions. Corporates currently taking a “wait and see” approach to compliance must act now to create a strategy for SEPA migration and ensure their new payments process is compliant and operating reliably well before the deadline. In light of the challenges involved, a lot of work may be necessary to implement new practices and policies into a workflow. For many corporates, the adoption of SEPA has served as a catalyst for change by instituting new policies and programmes with dedicated personnel responsible for the upkeep of the bank and customer/vendor data to ensure lasting integrity in the years to come. After all, the February 1, 2014 deadline is just around the corner, and the necessary compliance mandates do not discriminate between corporate sizes where payments are considered. Accuity offers a wide range of IBAN solutions designed to provide complete information for SEPA-compliant payment messages. As the leading provider of solutions that automate BBAN to IBAN conversion along with providing BICs for every IBAN, Accuity’s solutions help efficiently process IBAN payment transactions and reduce the amount of time and money spent on errors and repairs. This article was originally published on 24th September 2013 by Raconteur Media Ltd | raconteur.net and is reproduced with permission.